I survived the car-buying gauntlet, and brought my Toyota RAV4 home. But my brain was so focused on surviving the deal, I didn’t commit enough neurons to analyzing all the technology baked into the vehicle. The car comes with a ‘Smart Key’ remote instead of a standard key. All you need to do is carry the Smart Key in your pocket, and the car senses your presence. When you walk up to the car and reach your hand to the door, the car unlocks automatically. It seems the future has arrived! Actually, Smart Key tech has been around for more than a few years. 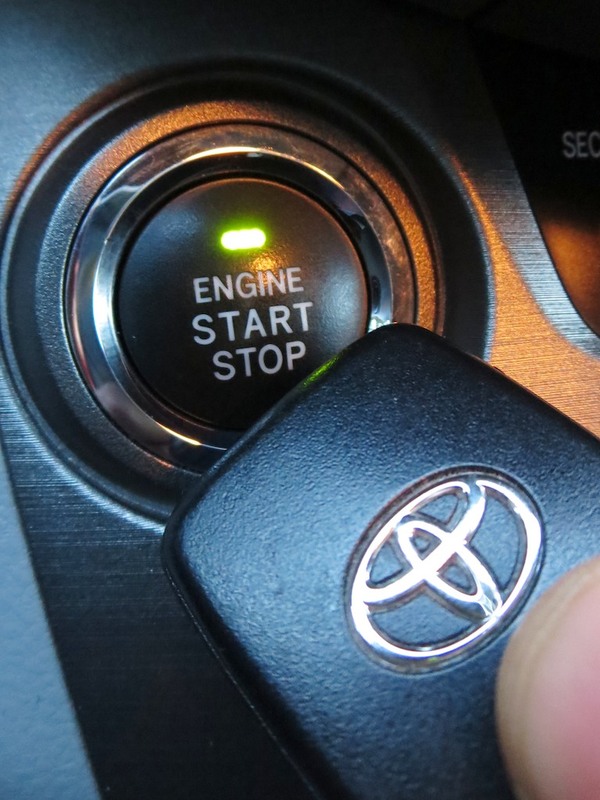 Today, lots of car brands are using this keyless ignition system tech. Beyond convenience, Smart Key technology is supposed to be more secure, since it uses rolling security codes to frustrate hackers. But as wonderful as it is, this advanced car tech can lead to some inconveniences down the line. let alone start the car. So what happens when your Smart Key remote dies? How do you get into your car without a physical key? The good news is Toyota thought of that. They slipped a tiny key into the body of the Smart Key fob. It’s totally hidden, and you’ve got to press a micro button to activate its release, like you’re 007. So that gets you in. But then how do you start the car? Remember, there’s no place to insert your James Bond back-up key. …that little techy love smooch will magically power up your car when you press the Start button. The ‘how’ of this tech voodoo isn’t readily accessible on the Internet. The service department rep at my Toyota dealer actually told me that nobody has ever asked her why ‘the kiss’ works before. Even without a working battery, the Smart Key remote has a passive proximity chip that’s activated when the frequency chip behind the Engine Start button sends out its radio signal looking for the fob’s start code. The ID card is called a proximity card and contains an itty-bitty antenna and frequency chip. Your card will receive enough power from the RF signal provided by the door’s reader device for the card to transmit back its presence. So in a sense, your car’s Smart Key gets enough juice from the car to ID itself in an emergency and get the car going! Sleeping Beauty always wakes up in the story, but I decided I should have a back-up plan, just in case. So I ordered a couple of batteries on Amazon to power my remote. And I’ll keep them in the car, just to be safe. That way, I’ll be prepared if I need to do emergency surgery on my Smart Key should it decide to loose its smarts and can’t be persuasive with a kiss. I know I might be over reacting. Besides, this problem isn’t supposed to announce itself without warning. Apparently, when the Smart Key’s battery begins to go… you’ll notice its shrinking capacity. Oh… here’s a final word to the wise, should you still be considering joining the Smart Key generation. Don’t lose your Smart Key. For the record, when I bought my RAV4 last month, the salesman warned me it would be an expensive venture to replace the Smart Key. I confidently replied I didn’t intend to lose either of the two fobs that came with the car. But of course, I was curious what the damage would be. So I called back my local Toyota dealer. Yes, it costs $440 to replace a lost Smart Key. I think somewhere out there you can buy a car for $440 that will pass inspection. How does one get to $440? That’s a far cry from getting a spare key for a few bucks cut by your friendly locksmith down the street. That said, I don’t plan on losing my fob. If I don’t have to take it out of my pocket, why would I ever lose it? I suppose the old practice of putting a key into an ignition switch is rather analog. What’s really so crazy about Smart Key technology? But isn’t it a little freaky how advanced cars are becoming? One day, ‘driving’ one of those cars is really going to take a lot of trust on my part. glove compartment. Because I’ll be bringing plenty of back-up batteries…!! I spent more than 30 minutes trying to find this info in the manual on-line, then just Googled it. You saved my day! This also happened to me but as well as the ‘kiss’ l had to lock the doors – unlock the doors and then start it. With this simple sequence of events all went well and the car starts once again. So it could be that along with the numerous silent prayers, curses and begging pleas. I’m not sure if you ca complete phase one without phase two at the same time.